Be the first to share your favorite memory, photo or story of Reuben. This memorial page is dedicated for family, friends and future generations to celebrate the life of their loved one. 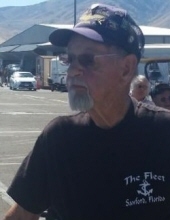 Reuben “Moe” Leonard USN retired, 88, of Chesapeake passed away Saturday February 2, 2019. Born in Salisbury North Carolina, he was the son of the late Carl Blanco and Marjorie Linder Leonard. He was predeceased by a son, Stephen. Moe is survived by his wife of 47 years, Marylyn Leonard; sons, James, Thomas, David and Wylie; seven grandchildren and six great-grandchildren as well as many beloved extended family members and dear friends. The family will receive friends to celebrate Moe’s life from 2:00 – 4:00 pm Saturday February 16, 2019 at Oman Funeral Home, 653 Cedar Rd. Chesapeake, 23322. In lieu of flowers memorial contributions may be made to the Chesapeake Humane Society. Friends are invited to share memories and sign the online guestbook at www.omanfh.com. To send flowers or a remembrance gift to the family of Reuben "Moe" Leonard, please visit our Tribute Store. "Email Address" would like to share the life celebration of Reuben "Moe" Leonard. Click on the "link" to go to share a favorite memory or leave a condolence message for the family.